Walk down to the sands and set up your family's spot for the day. Lounge by the pool and soak up the sun with a sea breeze in the air. Swim in the indoor or outdoor pool or drift in the lazy river. Rentals at the Bahama Sands are removed from most of the hustle and bustle of Myrtle Beach. You're only a few steps from beautiful Crescent Beach. Half inside, half outdoors, the lazy river flows through an open air expanse beneath the resort. Walk to the restaurants and souvenir shops of Main Street, North Myrtle Beach. Humor the kids with a stop at the (seasonal) indoor pool. Kids under 18 stay free with their parents at Bahama Sands Luxury Condominiums. This rental resort caters to kids, with a lazy river, indoor/outdoor pools, and beach fun. 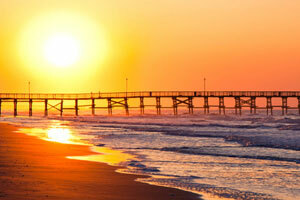 Located in quieter North Myrtle Beach, you’re away from the larger crowds of the main Myrtle Beach area. One of the best things to do here is just relax on the sundeck and let all your troubles melt away. - Front Desk hours are 7:00 am to 7:00 pm. Guests checking in after 7:00 pm will need to check in at Bay Watch Resort and Conference Center. - Entry to units will be through KABA door locks. Guest will receive e-mail 72 hours prior to arrival with KABA lock door Code. Code will be active at 4:00 pm for check-in time on arrival date. - All remaining documents such as parking permits, DVD Now card, attraction offers and Oceana Privilege Card will be provided in the guest room. - Guest Services will be available from 9:00 am-5:00 pm daily.